Change My Worldview: How Long Before we see the World’s First Trillionaire? How Long Before we see the World’s First Trillionaire? In the news in the UK last week was the latest Sunday Times Rich List, which highlighted the widening gap between the super-rich and the average person. Amongst the one thousand wealthiest British citizens, wealth, on average, rose by 5%. Meanwhile, average incomes are falling. A similar pattern is seen in the US. 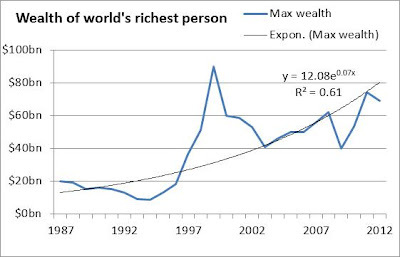 The growth of wealth among the super-rich is a global phenomenon. And the extremes of wealth are extraordinary: the 5 wealthiest people in the world collectively own $252 billion, equivalent to 10% of the UK’s GDP. An interesting question, I thought, is how long before we see the first trillionaire? So with a bit of help from Forbes and Wikipedia, I’ve done some research and very simple modelling on the subject. The first dollar-billionaire was apparently John D. Rockefeller, who made a fortune in the oil industry, surpassing the billion dollar mark in 1916. As of 2012, there are 1,226 billionaires with a collective wealth of over $4.6 trillion. Having examined historical data, the evidence points to an exponential trend in the wealth of the very rich, which shouldn’t surprise us as compound interest and GDP are both (exponential) driving factors. How might we forecast the year in which the first trillionaire will appear? I’ve taken three simple approaches. The first involves just two data points: Rockefeller’s first billion, occurring in 1916, and the record for individual wealth, set in 1999 by Bill Gates at $101 billion. 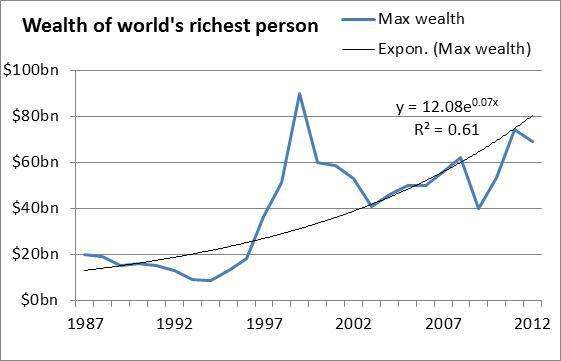 In 83 years, ‘Max Wealth’ went up two orders of magnitude. To reach a trillion, it only needs to go up one more, so let’s say this takes 41 years from Gates’ 1999 record and we’re left with 2040, i.e. as soon as 28 years’ time. My second approach is to use compound annual growth on today’s ‘Max Wealth’, which is $69bn belonging to Carlos Slim. Historical rates of growth of the wealth of the billionaires are highly variable, but smoothed ten-year CAGRs range from c.3% to c.9%. Taking the midpoint of 6% as my compound growth rate suggests a trillionaire will appear in c.2058, though of course volatility means it is more likely to happen before this. Thirdly, I have run a simple exponential curve-fitting analysis on the data published by Forbes for the world’s richest person over the last 25 years (shown above). Extrapolating the trend this produces into the future suggests the first trillionaire can be expected in 2052, though again volatility will likely bring this forward (and I haven’t tried to model volatility here). This is just theoretical number-crunching, so can we validate or sense-check these numbers? How about thinking about sources of wealth. Some of the most frequent sources of wealth are natural resource stakes, software and ecommerce, fund management and telecoms. Something these all have in common is ‘scalability’ as I explained in an earlier blogpost. Importantly, most billionaires gained their wealth through the growth and flotation of a large business. The largest listed companies are now worth several hundred billion and their founders tend to be multi-billionaires, so before we see a trillionaire we will first likely have to see a company with a multi-trillion-dollar valuation, with an individual still owning a substantial stake in it. This is would be eminently possible if the Saudi Arabian National Oil Company ARAMCO ever decided to list. Alternatively, a trillion-dollar company might be the result of pushing a new technological frontier. When this occurs, a company can grow so fast that competition law can’t keep up, and hence it can build a de facto monopoly as Microsoft and Facebook have each done in turn. Each tech boom is generating new companies with higher flotation values, so the first multi-trillion dollar IPO could occur within the next 2 or 3 tech cycles. Can we conclude anything useful from all this hypothesizing and number-crunching? I have five key observations. The first is that the super-wealthy are likely to get richer faster than the average person, unless something fundamental changes in the way our economies or taxation systems are organised, or a systemic financial disaster/ bout of deflation effectively ‘resets’ the world economy. Second: the world might produce a trillionaire sooner than most people would probably guess, inside of 2 to 3 decades. Third, that traditional macroeconomics does not include the super-rich as a variable, even though the wealth of a few individuals is now comparable to the size of entire economies. Fourth, that the ever swelling wealth of the ‘top 1%’ will structurally change how of the top end of most consumer industries run, as huge buying power is concentrated in a few hands (think luxury apartments, hotels, flights, education). Fifth, that the ‘bottom 99%’ will become increasingly dismayed at the rising disparities – and the sentiment of the Occupy movement will reach the political mainstream across the world. Who are the richest people in the world today?